space | A sip of my tea. The thing about having two blogs.. is when you hit on something you reeeeaaaallly resonate with you want to write it all over the place. So I am cross-pollinating.. knowing that the folks over here who are wordpress friends might not ever visit my website. I also realised rather annoyingly that I have a wordpress.org site? so I cannot add plugins. fuq that’s annoying. Here is another reason that web designers are probably a great idea.. and why in fact.. it will be wonderful when I reach a fruitful enough stage in time when I can choose to hire one! So… here is the content I shared over on my other blog..
As I went into my beliefs around my creative process.. my self as ‘artist’… the thought also flitted past… that I wish I had been shown this as a child.. growing up… I recall some really harsh teachers.. and how rubbish they made me feel… they didn’t realise (or care?) at the time the turmoil I had going on inside me. So, in my workshops I always hope that I can create circles in which artists, mums, friends, sisters, daughters, sons, dads, people who are grieving, people who are healing, anyone’s really.. can come and through the gentle process of intentional creativitea ….. enjoy a restorative space in time. 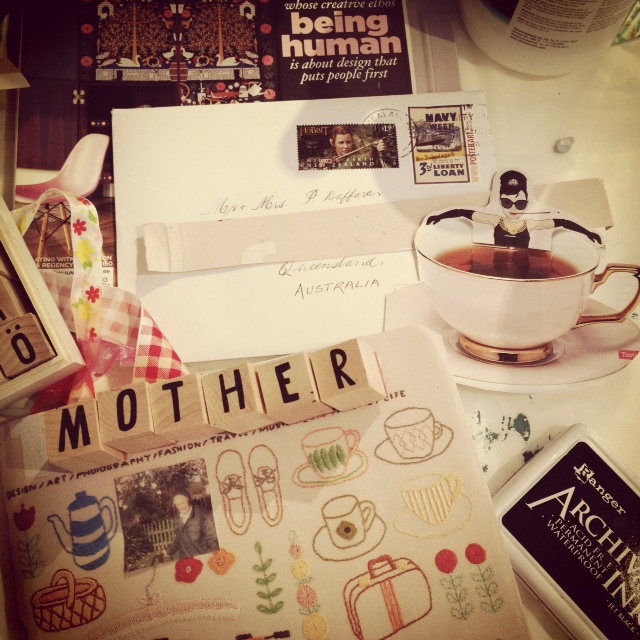 The picture above is from my art table on Sunday.. I’m creating a smashbook called ‘MOTHER LOVE’.. so I am putting in anything that reminds me of my Mum… and some things that relate to me as a Mother myself… when you create your own alchemical container.. you can decide whatever you like that will go in it.. and it’s perfect. Perfect for you. *please don’t freak out and think I’m a wanker for even having a mastermind group.. that’s a relatively new thing for me too and it truly happened by seredipitous… if YOU want be be in a mastermind group.. just put that desire out there.. ‘ask’ for it… and I’ll not be surprised if you ‘happen’ to meet a bunch of people.. just 2 or 3 even.. that are looking for just that same thing.. and ‘whala’ you got yourself a group who are wanting to be accountable to their success and are willing to support you in yours.